I am in love with my MacBook. I was so surprised when my parents said they were getting me a MacBook for my birthday. I cried happy tears in the store. My birthday isn't until the 20th but seeing as that's just a few days before I go to Sweden I already got it now so I can transfer files and install what I need before then. It fits in with my interior, too! @Laurein: Ja ze zijn superveel beter, ze maken GEEN geluid (bij mijn vorige hoorde je constant de ventilator blazen), het beeld is mooi, de batterijduur is IDIOOT lang en zo kan ik nog wel even doorgaan. @Nicola: Hah! Then we have to count back 9 months and see if there was something especially romantic going on that day ;) Happy birthday in advance! 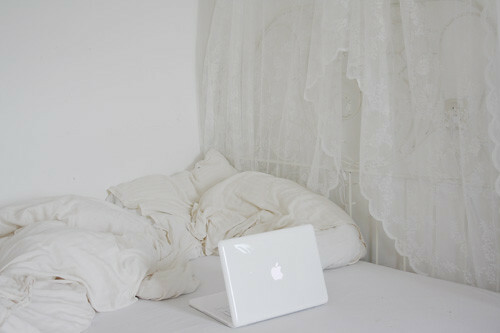 I love how its so simplistic and minimalistic (Your room). I love how your mac just seems to fit int so well.